We’re looking for a few good scrappers! From now until August 14, we will be accepting emailed entries in to our Kits2Remember Anniversary Kontest. One lucky - and talented - winner will receive a $250 K2R prize package featuring K2R products and more! There are five different categories you can enter your project in to: Acrylic, Metal, Mixed Media, Kits and Rubber Stamps. And the grand prize winner isn’t the only one getting some prizes! One finalist will be chosen from each of the five categories and receive a prize package worth $50. Click here for the Kontest details! We’re looking for some Komments! Kits2Remember would love to hear from you! We want some testimonials from real K2R customers who have been inspired by our products, classes and commentary (kommentary?). Comments will attributed to you, with your first name, last initial and home state/country. If you have a comment or two to share, and don’t mind your comment being posted to the Kits2Remember web site, please send them in to: Jessica@ kits2remember.com by August 3, 2009. In the subject line please put: Komments. A random “kommenter” will be chosen to receive an acrylic K2R stadium album and announced by August 7! 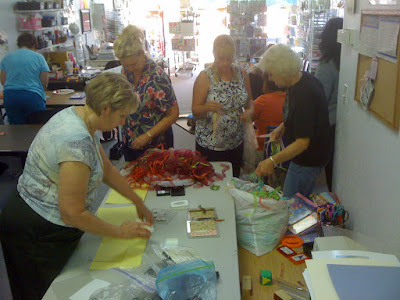 ... Thursday night, 10 ladies gathered at scraphappy here in Pensacola to learn how to use their Bind-it-All machines. 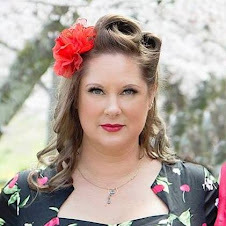 Christy, the owner of Scraphappy, really had a great deal: Buy the BiA for $75 (the normal price) and get the class free! So not only did these ladies leave with the machines, but they left knowing how to create four different types of projects with them. 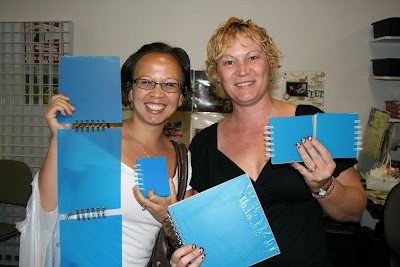 Here are two happy ladies - Heather and Natasha, with the projects we made. Week 3 of the K2R Celebration! It’s Week 3 of the Kits2Remember Anniversary Celebration! Yesterday, K2R celebrated its 2nd Anniversary and I celebrated by messing around in my scrap studio... photos of the finished products to come soon... as soon as I put the finishing touches on them! 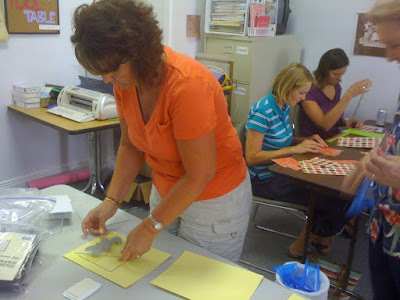 If you are in or around the Pensacola Area, I am teaching a Bind-it-All class at Scraphappy. Owner Christy loves the tool and has asked me to come and teach her customers the basics... gee, Christy, twist my arm! I'll be sure to take some photos of the stuff we do - we'll be creating four different projects in one evening! 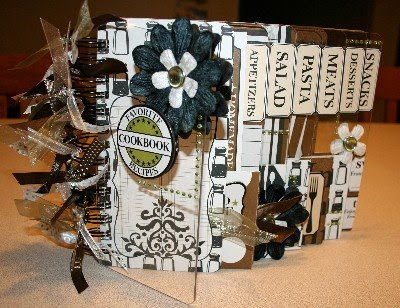 Also, due to a conflicting event in the scrap world here in Western Florida, my stadium album cookbook class at Scraphappy featuring Teresa Collins' Haute Cuisine line has been postponed to August 22. Check out the K2R Calendar for details! I am also excited that a new scrap store close to me is scheduled to open August 1 - Scrap That here in Pensacola, will be located at the intersection of Sorrento and Blue Angel. Don't forget to submit your entry in to Kits2Remember Anniversary Kontest! From now until August 14, we will be accepting emailed entries in to our Kits2Remember Anniversary Kontest. One lucky - and talented - winner will receive a $250 K2R prize package featuring K2R products and more! There are five different categories you can enter your project in to: Acrylic, Metal, Mixed Media, Kits and Rubber Stamps. And the grand prize winner isn’t the only one getting some prizes! One finalist will be chosen from each of the five categories and receive a prize package worth $50. Click here for the Kontest details! We’re also looking for some Komments! Kits2Remember would like some testimonials from real K2R customers who have been inspired by our products, classes and commentary (kommentary?). Comments will attributed to you, with your first name, last initial and home state/country. If you have a comment or two to share, and don’t mind your comment being posted to the Kits2Remember web site, please send them in to: Jessica@ kits2remember.com by July 20, 2009. In the subject line please put: Komments. A random “kommenter” will be chosen to receive an acrylic K2R stadium album and announced by July 23! A huge thanks goes out to those of you have already sent in your Komments! Find K2R on Facebook! Join the K2R Krew's group and stay on top of the latest and greatest K2R news, events, ideas and more! ... 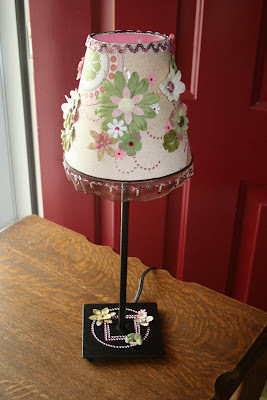 I spent a good part of yesterday working on decorating this lamp. 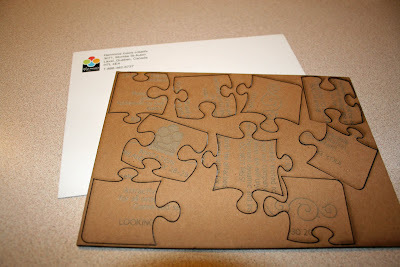 The organizers of Creative Escape sent it to me last month to decorate and send back to them. A number of current and former CE instructors have been invited to participate. Why a lamp, you might ask. The theme of this year's event is "Let Your Light Shine!" 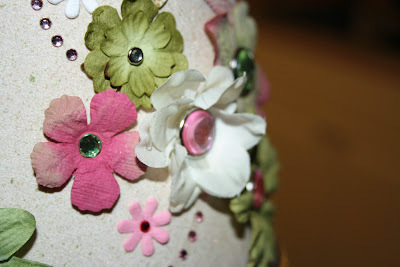 I decided to incorporate CE's signature colors of pink and green, using My Minds Eye glitter papers, Tattered Angels Glimmer Mist, Heidi Swapp Bling and a collection of flowers and bling brads. I hope I get a chance to see what some of the other instructors have done. 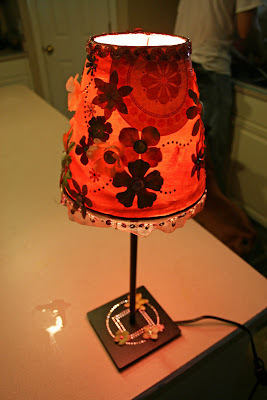 At CE next month, the participants will have an opportunity to bid on their favorite lamps and the proceeds will go to the Leukemia & Lymphoma Association. What a "bright" idea! Celebrate with the K2R Kontest! In celebration of K2R’s anniversary, and in appreciation for your patronage, I would like to extend a 15 percent off discount (not good with any other offer besides free shipping) to everyone through 5 p.m. CST July 20, 2009. Just use promo code ann15 and be sure to click through all ordering steps. This discount applies to everything in the store! Also, for every three project kits you purchase, you will receive a surprise project kit FREE! And remember, when you spend $75 or more after discounts and before any taxes, you will get free shipping! The K2R Krew is posting away and they have got some great new ideas. Check those out on their blog! You never know when they might be giving away an RAK! 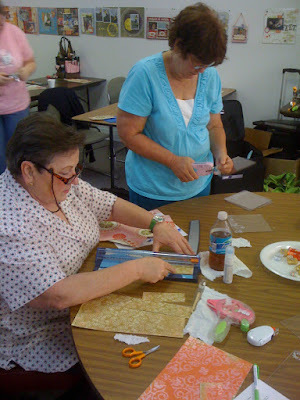 My next class at Scraphappy is July 23, a Bind-it-All class that includes the Bind-it-All machine with the cost of the class. We'll create four different project configurations with this fabulous tool. This is a class you won't want to miss if the BiA has ever caught your interest! I just scheduled an August class at Scraphappy: My acrylic cookbook stadium album using the Teresa Collins Haute Cuisine line. The class will be 1-5 p.m. on Saturday Aug. 8. More details will soon be up on the K2R Calendar. K2R pal Scrapbook Joe is at it again! 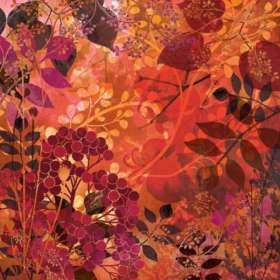 He has created some of the most gorgeous acrylic albums I have ever seen over the years. Here is one of his latest: A tribute to Hello Kitty. Stay tuned to K2R next week, as the 2nd anniversary celebration continues! The Krew and I will be announcing the K2R Kontest, plus there will be some opportunities to randomly win some K2R products and more! An email newsletter will be sent out early next week, plus the news will be here on the blog. If you haven't signed up for the newsletter already, you can do so on the K2R home page. ... July is Kits2Remember’s anniversary month! On July 20th two years ago, I purchased the web address for Kits2Remember and began loading merchandise into the online store. 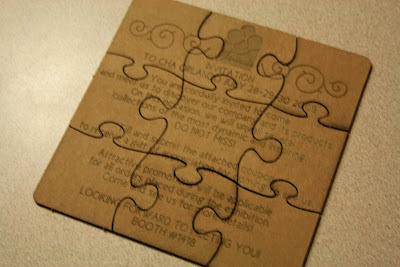 Back then, the only products were simply kits I had created that could be used with the Bind-it-All binding machine. Since then, Kits2Remember has not only added to its collection of project kits (and not just for the Bind-it-All anymore! ), but raw products, such as acrylic panels (added in October 2007), chipboard sheets (added in November 2007), metal panels (added in August 2008) and flourish rubber stamps (added in March 2009). And a huge thanks goes out to you, my customers and inspiration … without you Kits2Remember would not be the creative papercrafting and scrapbooking resource it is today! Next week I will announce the details for the K2R Kontest, where anyone can submit a project they have created with K2R products for the chance to win a prize package worth $250. The K2R Design Krew and I are really excited about the Kontest and can’t wait to see the projects submitted!